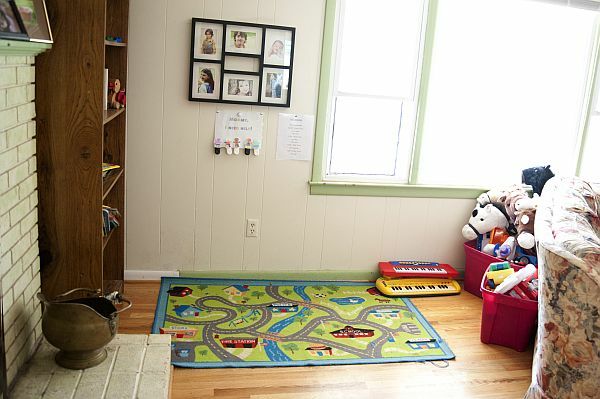 7 Quick Takes – Creating a play room and revamping the school room… and everything else! 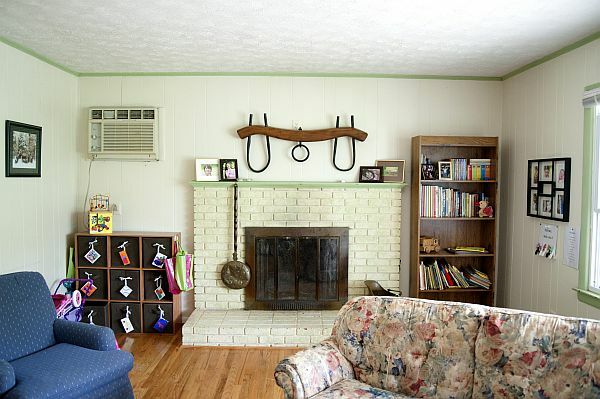 The BIGGEST, most important thing on my “build a house” list is that I want a play room right off the living room. 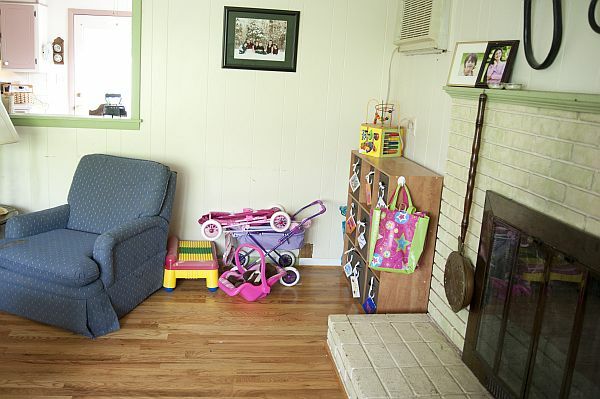 This is hugely important to me, because we’ve found that the best way to keep down clutter in the rest of the house is to keep all the kid’s toys in the living room. Works great for keeping the bedrooms clean, but the living room is always a wreck. 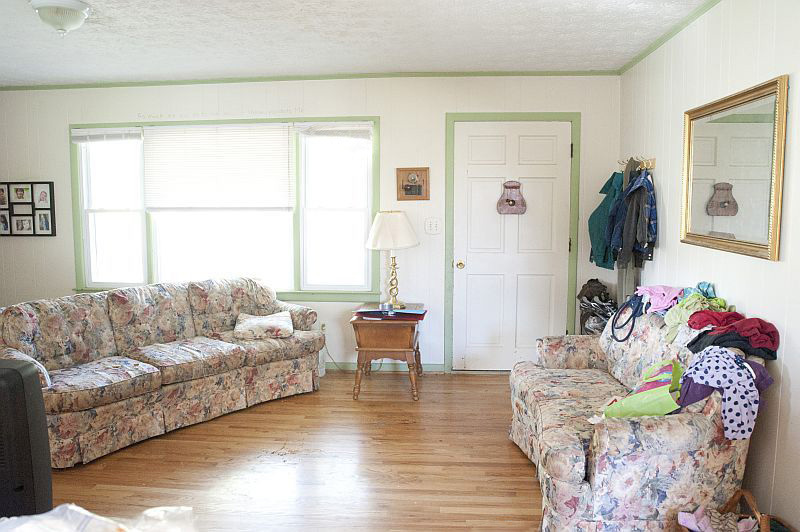 For years, I’ve been wanting a space for the kids to play in, but it never occurred to me that the solution was right in front of my nose until I saw the setup at Amber’s… Her couch was moved AWAY from the wall and placed at an angle to create space behind it for a play area. Genius!!! This was originally posted here and the basic idea is that when the kids need me they can clip one of these to my shirt. Normally, I don’t mind being interrupted and I can usually answer them pretty quickly, but there are times (when I’m on the phone, for instance) that they’ll need to wait for an answer. 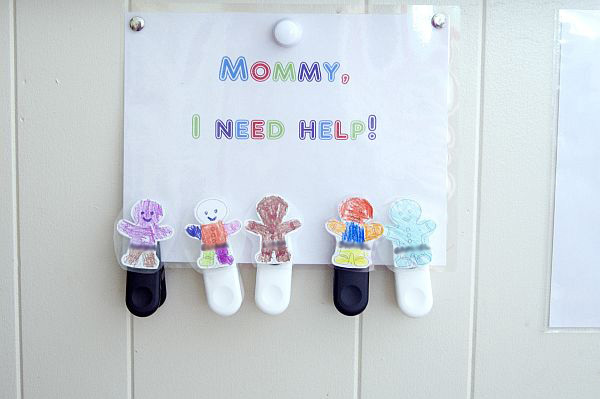 During these times, they can grab their clip, attach it to me, and know that I will get to them as soon as I can. LOVE IT!!! The table now sits to the SIDE of the room, and is in front of the two cabinets, rather than between them. The bookshelf with all the tupperware containers is new – I just moved it from the kids room (we wouldn’t have had room for it, before, and all the kids books are now on the shelf in the living room) and we just hung the hanging sorter on the wall. The bins are part of our new workbox system (we’re using a method similar to this with activity cards I printed from here) and almost everything was done utilizing things we already had on-hand. 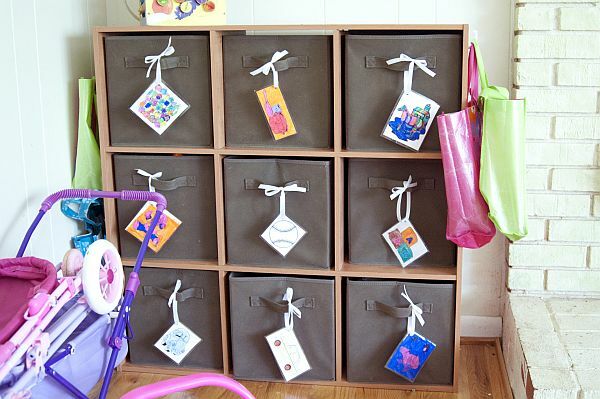 This is the cabinet that is accessible to the kids whenever they want to draw or do an art project. 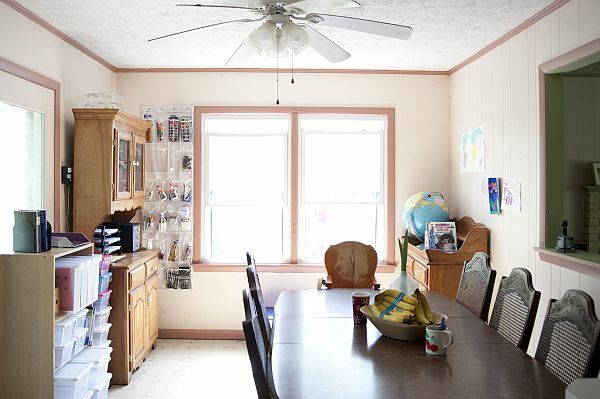 We have another one in the kids room for things like socks and headcoverings, and we’ll eventually get another one for the hall closet to organize things like gloves and hats, and one for the kid-accessible side of the kitchen but we’ll need to build up our supplies, first. 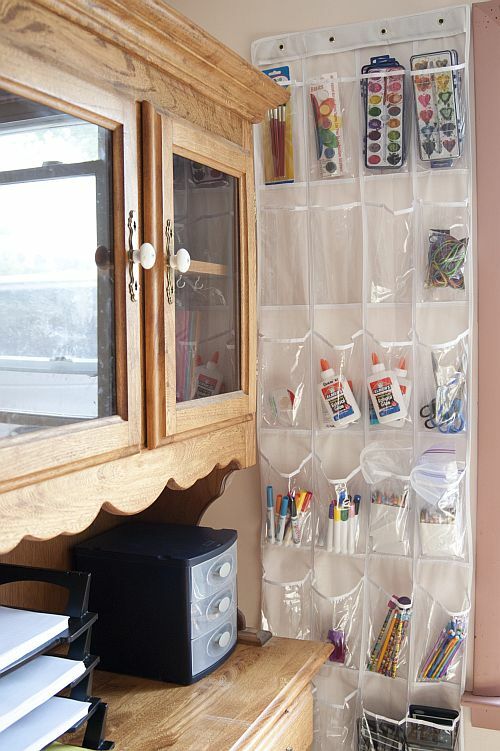 This one is perfect for the school supplies – it keeps them all right where I can see them at a glance, I don’t have to go digging through drawers for anything, and I can quickly access when we’re running low on supplies. LOVE IT!!! Of course, the organizing didn’t stop there. How could it?! I was on a roll! :) I completely re-vamped my husband’s desk, the girl’s closet, my photography area, and cleaned out our hall closet and emptied an entire dresser and several drawers in another dresser (what am I going to do with all this extra SPACE??!!) I also gave each of the girls a “keepsake” box for all the special artwork and note cards they want to keep that were previously just floating all over their bedrooms. It feels SO GOOD to have places for all these things that were previously everywhere and anywhere! I’ve mentioned before that I’m not exactly skilled in the art of organization, but seeing Amber’s house and getting ideas from her really gave me the push in the right direction I needed to figure out new ways to utilize our space! It also helped me not be afraid to think outside of the box and move things around in ways I wouldn’t have thought of before. So now, as my husband said, it’s like we’re living in a classroom (or a daycare!) And the funny thing is, I’m LOVING that! I think I’ve resisted a lot of changes I could have made before because I thought it would make my house look cluttered and unsophisticated (I think I’ve always had this “better homes and gardens” ideal in my head, which would probably be really funny to anyone who has ever actually SEEN my house with it’s easter egg paint job in the front of the house, dark brown and bright red carpets in the back of the house, and nary a matching towel or linen set to be found anywhere throughout!) Nevertheless, I’m THRILLED with the way things are right now, and thrilled with the way my husband and kids have responded to it! In a way, I’ve always felt a little lost when it comes to homeschooling not so much for lack of ideas but just because I didn’t know how to MANAGE anything (i.e. “stuff.”) When you asked me if I wanted the things you were passing along and I said I didn’t because I didn’t have any place to put them, that’s kind of been how everything has been for me… I didn’t have a place to keep [things] where they wouldn’t get destroyed, and I didn’t have anything in place to say “okay, this is just for craft time, and during craft time X and Y and Z happens and after craft time, A and B and C happens” in order to keep our stuff organized and in nice condition, etc. It just completely overwhelmed me ALL of the time. I feel that it’s a little too early to say this, but I’ll say it anyway… the Getting Things Done book has really changed my life! Had I visited Amber’s house a year ago, I don’t think that anything in my life would have changed, because the steps involved to change things would have seemed too overwhelming. 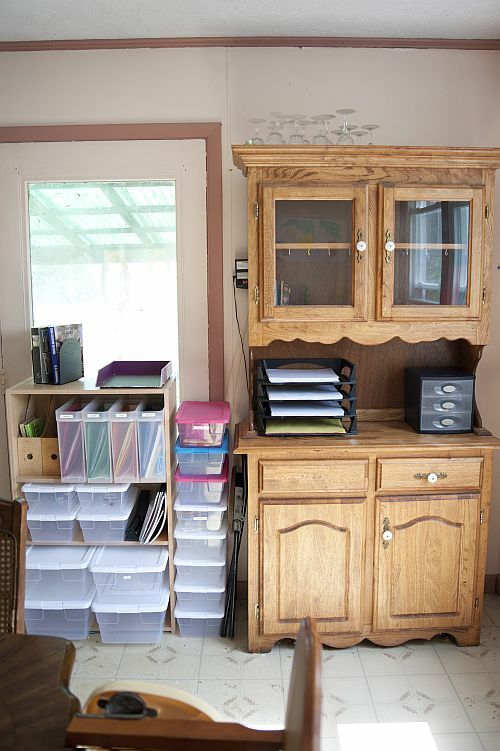 Now, they’re just part of the system, and all my ideas for more household changes and more homeschool activities and more craft ideas are getting filed away in my little folders and slowly but surely we’re getting it done! This entry was posted in Cleaning/Organizing, Daybook, Homemaking, Homeschooling, PERSONAL, Seven Quick Takes. Bookmark the permalink. 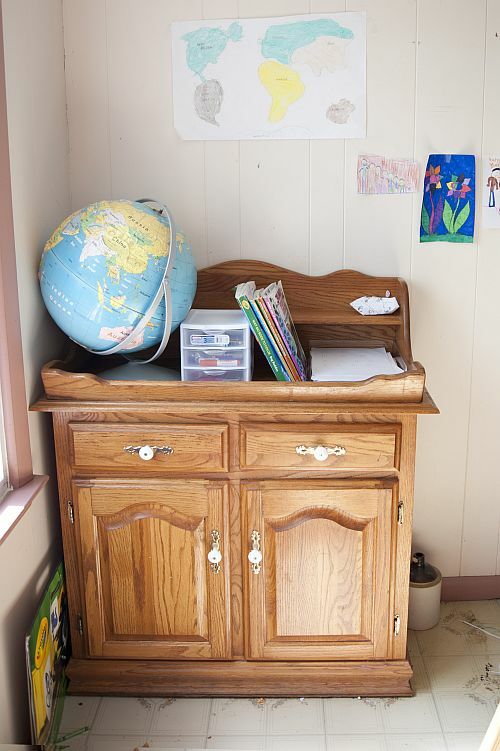 4 Responses to 7 Quick Takes – Creating a play room and revamping the school room… and everything else! Thank YOU for posting the video! 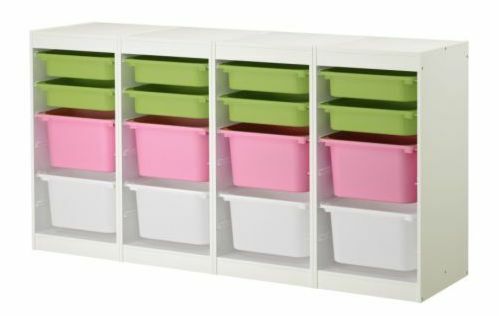 I’ve been thinking a lot about workboxes but couldn’t figure out a way to make them work for our family (I didn’t want tons of boxes for each child) and your idea was perfect! I’m really excited about getting started with it! Rina, such a good idea. When I homeschooled, I did it at work. We had an extra office that I turned completely into a classroom. We were lucky in that I could leave the room at work. After she got older and we moved where we are now, we had an extra room and I didn’t want to spend as much time at work, so I moved it to the house. Organization is the key. My old chemistry teacher from high school came by the shop to buy glass and I showed it to him. Come to find out he was the new “liason” between school and homeschoolers. He told me that I was doing a fabulous job, which thrilled me, because I’m sure you are well aware of the trouble that can create. He said as long as I did what I was doing, there would never be a reason for him to pay me a visit. Homeschooling is so great, I wish I had done it with my others. Keep up the good work. Your house looks so organized.